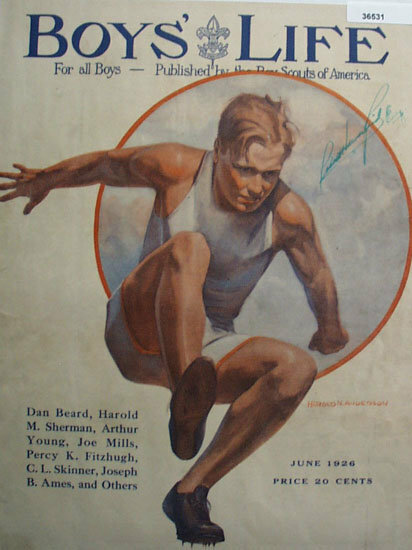 Boys Life Magazine Cover 1926. This color June, 1926 Boys life Magazine Cover published by Boy Scouts of America. Picture by Harold N. Anderson shows boy with spikes in shoes jumping. Names Dan beard, Harold M. Sherman, Arthur Young, Joe Mills, Percy K. Fitzhugh, C.L. Skinner, Joseph B. Ames and Others are listed on cover. Magazine tear sheet picture is taken through plastic and may show wrinkles or crookedness that is not in the ad. This Original magazine tear sheet measures 9 3/4 inches wide by 13 1/4 inches tall. Items Similar To "Boys Life Magazine Cover 1926"